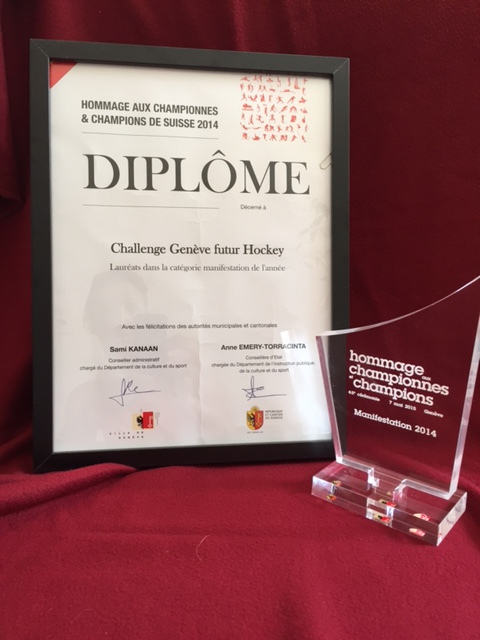 The Geneva Future Hockey Challenge has received this Thursday, March 7, 2015 the price of the "event of the year" at the ceremony " Tribute to Champions and Champions - Editions 2015," organized by the City of Geneva, the Canton of Geneva and Association of Geneva Municipalities . Nominated alongside the Disc Golf European Championship and the Geneva 2014 Games, the GFHC won this award, a sign of great recognition . Supported by the Neva Foundation since five years, the GFHC is becoming a reference in the Geneva sporting landscape inviting in 2014 no less than 32 invited teams from all around the World (Sweden, France , Canada, Russia... ).